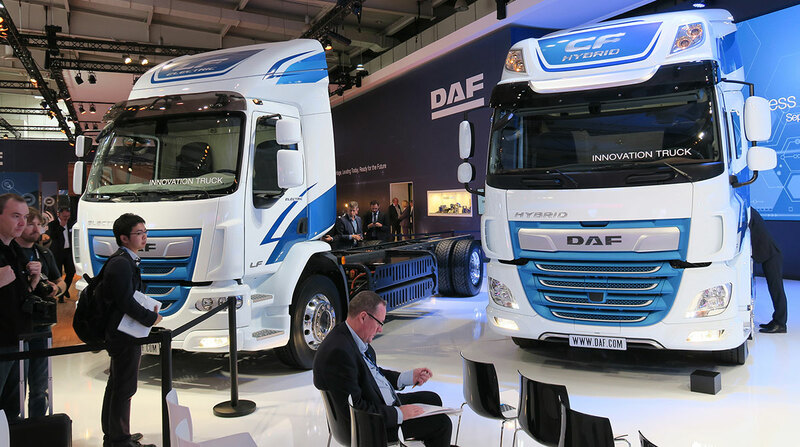 HANOVER, Germany — DAF Trucks exhibited two full battery-electric tractors and one hybrid model at the IAA Commercial Vehicles show, illustrating how electric-vehicle technology could be adapted to different trucking applications. The truck maker showcased its LF Electric and CF Electric tractors for medium- and heavy-duty urban distribution and the CF Hybrid for midrange distribution. These three “innovation trucks” represent “a key part of DAF’s vision of future transport,” DAF Trucks President Harry Wolters said here Sept. 19 at the company’s IAA press conference. DAF is part of Paccar Inc., which also is parent of the Kenworth and Peterbilt truck brands. The LF Electric features Cummins technology and provides a range of up to 137 miles while fully laden, an ideal range for city distribution, DAF said. The CF Electric, meanwhile, is designed for urban applications that require higher payloads and volumes such as supermarket delivery. The truck, which uses VDL’s electric power technology, has a range of about 62 miles. The CF Hybrid, in contrast, incorporates a combination of electric and diesel power. The truck can drive on electric power with zero emissions in urban areas for 19 to 31 miles but also can run on diesel when operating outside of the city to provide a much greater vehicle range. The CF Hybrid features the Paccar MX-11 engine and a ZF electric motor, along with a ZF TraXon gearbox for hybrid drivelines. The diesel engine can charge the electric batteries during on-highway operations, DAF said. The first CF Electric models will enter field test operation with select customers this year. DAF Plans to begin similar field tests with the LF Electric and CF Hybrid in 2019. Ron Borsboom, a DAF board member responsible for product development, said battery-electric trucks will be ideal for driving in the city, where emission-free operations may be regulated. For applications that involve driving in the city and on the highway, hybrid technology “offers excellent vehicle flexibility,” he said. In the future, the use of fuel cell technology to extend the range of battery-electric trucks could become an effective option for longhaul as hydrogen distribution expands, Borsboom said. In the meantime, DAF will continue to enhance its diesel powertrains by further improving integration, he said. DAF also highlighted its advances in fuel economy over the years. The company’s 2018 XF model represents a 20% reduction in fuel consumption compared with the same model in 2001 with the same specifications and driving conditions, DAF said.